“Eh?” Kiku and Miko looked up in surprise. Miko was almost beside herself when they left the bathhouse. 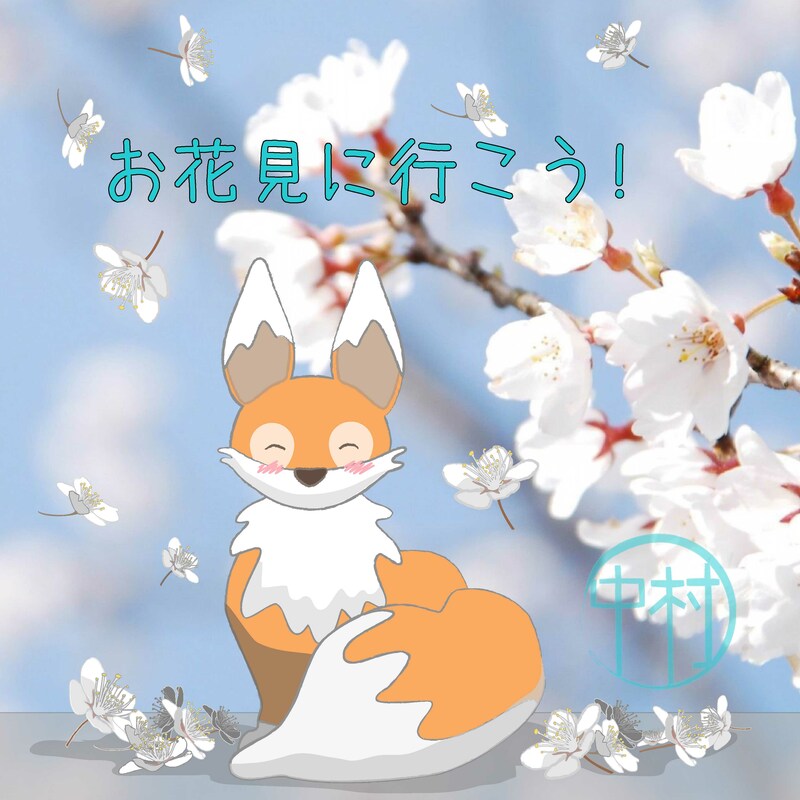 She was so excited to enjoy food and drink with her friends under the blossoming trees. 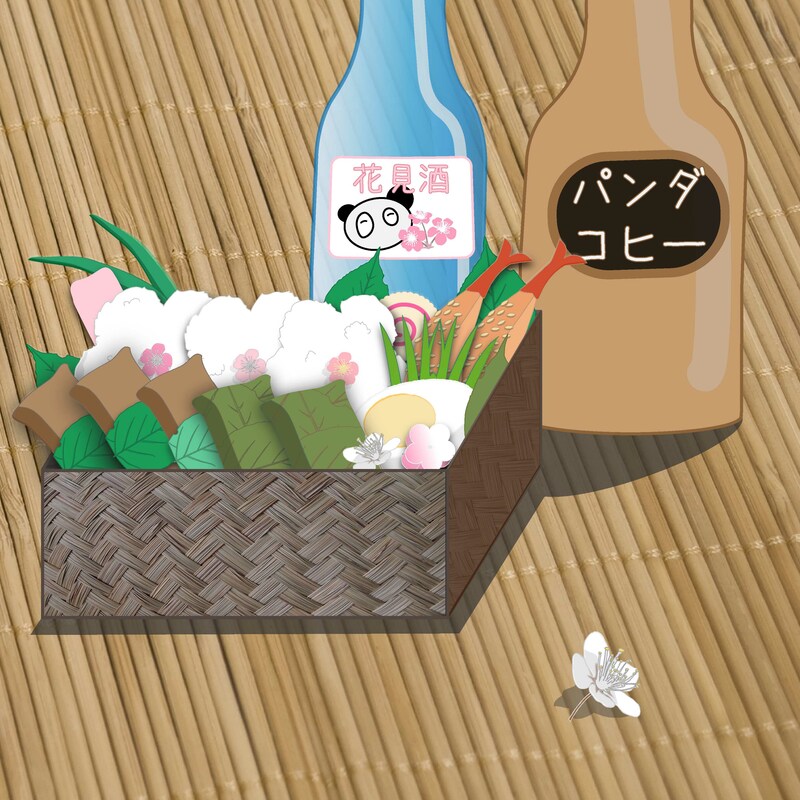 Even more exciting was that Mama Kojin had packed special hanami obento, or lunchboxes, complete with sakura shaped rice balls (onigiri) and little cherry blossom shaped vegetables. 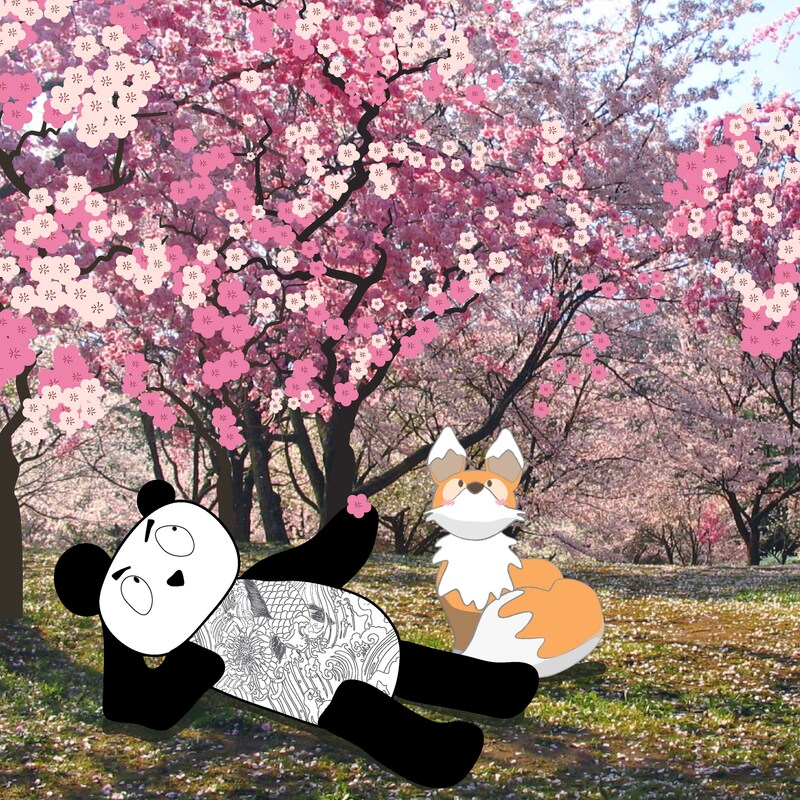 “But why do the Japanese get so excited by the cherry blossom flowers?” asked Kiku. 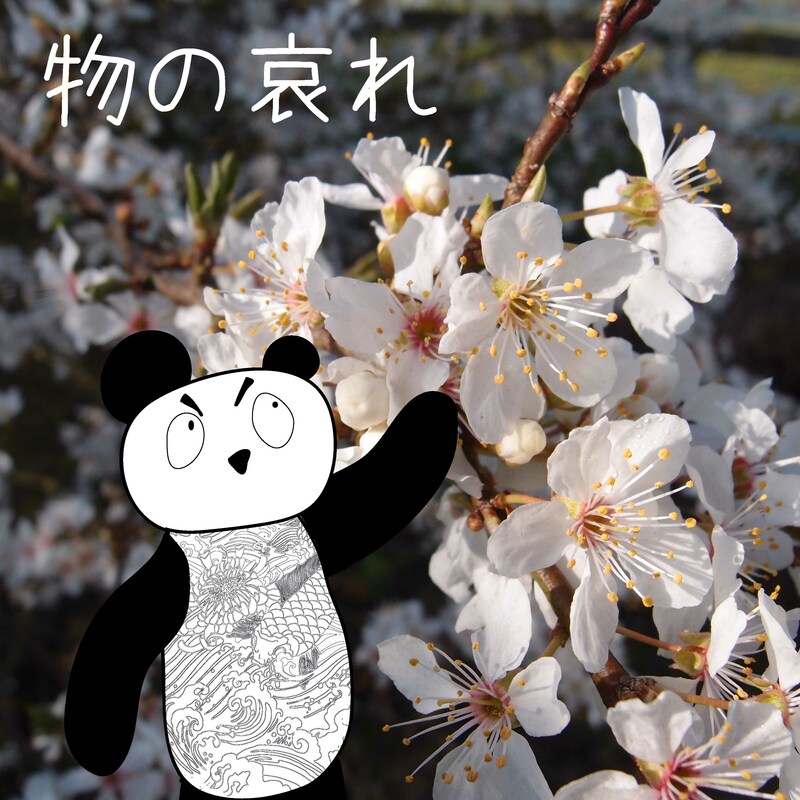 “Ah…” said Boss Panda… “to understand that you need to know about ‘mono no aware’ (物の哀れ)”. “What is that? ?” chimed Miko-chan and Kiku together. Kiku followed them along the blossom lined pathway, still soaking up the beauty and watching the sun go down. Cherry blossoms and their arrival are a very big deal in Japan. People take part in hanami – which literally means ‘watching flowers’ and most often involves picnicking under a blossoming tree, or with a great view of them. It is also a rare occasion in which people get to leave their offices with their work colleagues and get some fresh air. People often take part in several hanami, with their work, and others with friends and family. When the cherry blossoms open depends on the temperature (typically the very end of March and beginning of April), and the opening of the blossoms moves up the archipelago of Japan, from the southernmost islands up to the northern island of Hokkaido, and some people follow this ‘sakura front’ in order to film or photograph the beginning of spring as it arrives across Japan. In Tokyo, when the first five flowers open on the sample trees in the grounds of the Yasukuni shrine, the cherry blossom season is declared officially ‘open’ with the ‘kaika sengen’ or ‘blossom bloom declaration’. Full bloom is known as mankai and comes 5-7 days after the opening of the first flowers (known as kaika). After another 5-7 days, the petals begin to fall from the trees, a process often speeded up by wind and rain. A blizzard of falling petals is called ‘hanafubuki’, and where the trees are over water, the entire surface goes white or pink.